“But she’s so cute in her little glasses!” exclaims the well-meaning lady at the supermarket who has been staring at your bespectacled child. When you first learned your child needed glasses, you may have felt relieved that the solution to her problem was so simple. However, you soon learned that actually having a child with glasses can bring a whole new twist to your life. Having a child that may stand out from the crowd–even a tiny bit–may only be the beginning. Some parents wonder if they are responsible for their children’s poor vision. Perhaps bad eyesight comes from their side of the family, or perhaps they realize in hindsight that they should have recognized their child’s problems sooner. Ann Z at littlefoureyes.com suggests that parents let go of any feelings of guilt that they might have. It can be “difficult to catch” vision problems in young children who aren’t able to articulate what they are experiencing. Furthermore, because they have never experienced better vision, they don’t realize that anything is lacking in what they have. As for genetics, those are not something a parent chooses either. It’s best to lay aside any feelings of guilt and concentrate on helping your child. Children old enough to help choose frames will be happy to see several styles that are just their size. 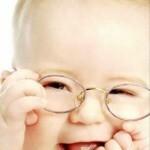 They can enjoy taking ownership of their glasses by choosing their favorite color or cartoon character for the frames. Be sure to get something sturdy and consider a band to keep glasses in place or at worst, around their necks. Older children may not require much guidance when it comes to wearing and caring for their glasses, but younger children can require constant supervision. Short, simple rules can help them learn how to treat their glasses. Teach them to always use two hands to take their glasses off, and to always give the glasses to Mom or Dad. Young children with glasses are often prone to flinging them aside at any given moment, and they don’t necessarily think about what will happen to them after that. It’s important that they understand that the glasses must stay on, and they must go to their caregiver if they are not on. As a parent you understand perfectly well that your child remains your child, whether he wears glasses, dyes his hair, or grows another nose. But emotionally it can be jarring to expect to see your child and instead see a kid with glasses. Some parents may experience a form of grief as they come to accept that their child has to wear glasses and may always have vision problems. Fortunately, most children who get glasses can suddenly function in their world better than they had ever dreamed, because they can now see clearly. It’s actually a good thing that something as simple as a pair of glasses can make such a difference. As they grow older, contacts or LASIK surgery may allow them to leave the glasses behind. In the meantime, glasses can help them shine now. Guest author Sara Roberts has a background in health and technical writing, and when not working is (happily) busy being a mother of two rambunctious boys ages 4 and 6. She's also a content contributor for Just Eyewear an online retailer of eyeglasses. Are You Overdue A Health Check?